I have implemented payments using PayPal IPN checkout. Is there any way to make PayPal checkout window with "Pay with PayPal Account" Panel open by default on the right side? Currently, it always shows "Pay with credit or debit card" panel. There's no real way to control that window. It depends entirely on PayPal and what they choose to feed the user. Keep in mind, most people want the credit card portion open by default (I've heard far more people ask for the exact opposite of your question). Some users may even be presented with Bill Me Later options. If it's that important, you could always integrate express-checkout directly. Requires some programming on your part but does not offer any credit card options. Express Checkout is free to use. Not the answer you're looking for? Browse other questions tagged paypal paypal-ipn or ask your own question. 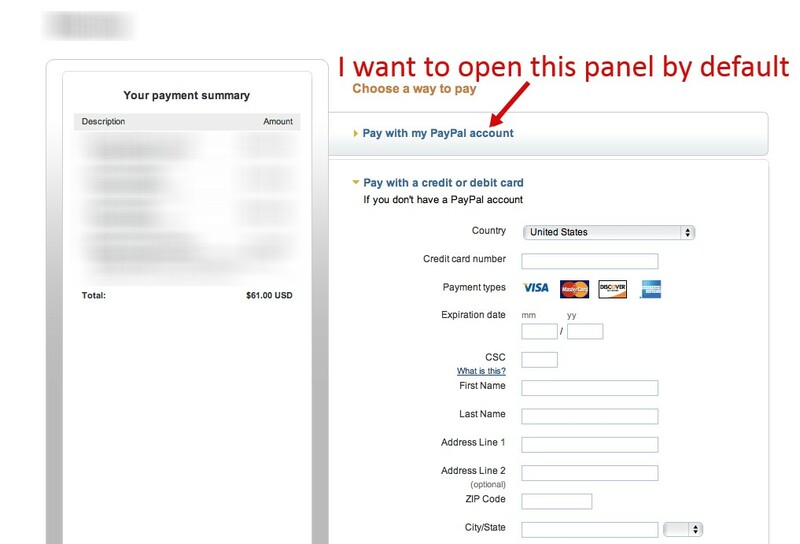 How to open PayPal checkout with opened “Pay with a credit or debit card” tab?